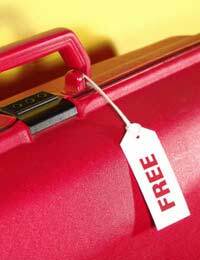 What Is The Catch With Free Holiday Schemes? Home > Holiday Scams > What Is The Catch With Free Holiday Schemes? It sounds like it's too good to be true - you get a telephone call out of the blue from a very friendly sounding person who tells you that you've been very lucky and won a free holiday. Fantastic, you think, although you can't remember where you entered the competition. It sounds great, and the person explains to you that you've won a holiday, and that there are no catches, it's not a scam, you just need to attend a presentation to get your prize. It's a bit odd that you have to collect the prize; surely you should be sent it? But you think that it might be nice anyway, as the presentation takes place in what sounds like a nice hotel. Often there are drinks included and a buffet too. What have you got to lose? You're probably a bit suspicious though - it sounds like there should be a catch. If you mention this to the person on the telephone, they will tell you that there will be a presentation about a new holiday club, and no, it's certainly not a scam, or timeshare. You might ask what's included and if you have to pay for anything - and you will be told no, you've won a two week holiday abroad. What they won't tell you is that you may have to pay to fly out there, you'll certainly have to pay out for all extras, and your holiday could well be somewhere you don't want to go, or on a date you can't make. What Happens at the Presentation? Often the presentation will be at a very nice hotel. You'll be given drinks, and brochures explaining all about an exciting new holiday club that will offer you great value holidays in exotic places all over the world. What about the free holiday? Well, all you have to do is sit through a short presentation from the sponsors and you'll be given your free holiday voucher. If you can't wait - you don't get the vouchers. You might find that you're put under pressure to sign an agreement for a 'holiday ownership' on the spot. Don't do this under any circumstances. If you sign up you could find it impossible to change your mind, so be firm and explain that you want some time to consider the offer. Keep an eye on the free alcohol - claim to be driving even if you're not, because they will use free booze to get you into the mood to sign up They might tell you that there's a special discounted offer just for today - it's very unlikely. Because these holiday club schemes aren't technically classed as timeshare agreements, you don't have the protection of the Timeshare Act if you change your mind after signing up for membership of the holiday club. You could find that once you've signed, you're stuck with it, even if you decide the scheme's not for you. What Is a Holiday Club Scheme Anyway? It sounds very similar to time share, in that you're promised holidays whenever you want them, wherever you fancy. You're not buying a property; you're buying a holiday in any one of their properties. In the real world though, holidays are not always available when and where you want them, if at all. The sales people could tell you that membership to this sort of club is valuable, can be sold on to eager buyers and can even be left to someone in your will. Ask yourself - if these memberships are so valuable and desirable, why do they need to offer a free holiday to get people to sign up for them? Are Any Holiday Club Schemes Reputable? Freedom to take the contract away with you and spend a few days making your mind up. A contract that is understandable, and which broadly represents what you were told at the presentation. If you have been misled by a holiday club, or you think that you've been caught out by a scam, tell the Office of Fair Trading. They can't get the money back for you (you may have to take legal action to recover it) but the OFT have the powers to stop clubs from using the same tactics in future - if people tell them about it! When Is The Right Time For Timeshare Resale?